Using our unique data set, we have analysed the behaviour of our users in the Americas region to provide a view of their destinations of choice based on different dimensions, their interest in different global events, as well as their travel planning behaviour. Additionally, we have differentiated between search and exit data, to look at the gap between interest and action. The most popular destinations by searches and exits. The top growth destinations by searches and exits. The most popular long-stay destinations by exits. The first analysis revealed the top 10 destinations by searches, and top 10 by exits, which are shown in the rankings below. Looking at this reveals two key trends. Firstly, the alignment between search and exit ranks suggests that there is very little difference between interest and action when it comes to travelling to the most popular destinations. And secondly, although 50% of popular destinations are within the Americas region, 40% are within Europe. This highlights the desire and ability for Skyscanner users in the Americas to travel further afield. We can predict how these rankings might change in the future by looking at the top growth destinations by searches and exits. For example, there are high search growth rates for Mexico and Brazil, as well as for Germany and Thailand. This indicates that interest in travel to these locations is rising, however there are deterrents – perhaps price – which are stopping users from exiting. The only destination to experience a growth in searches and exits is Japan. If this travel trend continues, it could enter the top 10 destinations list within 2018! The popularity and trend towards destinations shifts substantially when we isolate travel for long-stay holidays. For this type of travel, we can identify an increase in the rank of destinations outside of the Americas region such as Spain (from 4 to 3), India (from 7 to 4) and the UK (from 6 to 5). Additionally, Thailand takes the 10th position, replacing Argentina. Having said this, the United States continues to see the highest growth rate within the top 20 most popular destinations. This is followed by the Philippines, which has yet to enter the list of top 10 long-stay destinations. 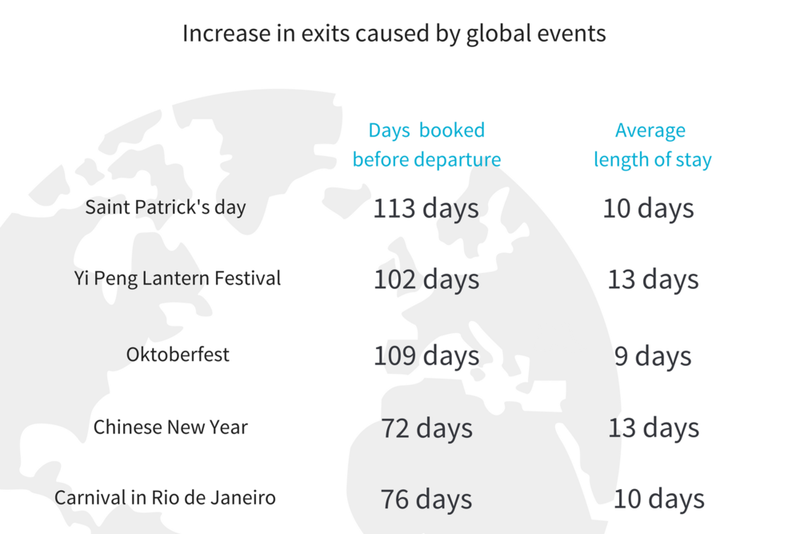 To identify which global events drive Skyscanner users in the Americas region to travel, we looked at which popular festivals drove a growth in exits – along with the travel behaviour of individuals travelling to the event. As is evident from the chart below, the event that drove the highest growth in exits* in 2017 was Saint Patrick’s Day, which resulted in 100%+ growth in exits. With Skyscanner users in the Americas planning their travel an average of 113 days before their flight and staying an average of 10 days at their destination. The Rio Carnival, on the other hand, drove just over 2% growth for the festival period*. By analysing Skyscanner data for users in the Americas, we have also identified trends in their search and exit behaviour. For searches, the summer months have the highest volume of searches each month; and Tuesday is shown as the most popular day of the week to search. Similarly, Tuesday is the most popular day to exit for users in the Americas – highlighting a tendency to be inspired and/or research, as well as act, within the same day. The most popular months to exit on, however, are October and November, which does not align with the months with the highest search volumes. Despite the popularity in destinations such as Mexico and Brazil and the increasing search volumes for Germany and Japan, the United States is both the fastest growing long-stay destination and the top-ranking destination by searches and exits. India and Thailand are both popular destinations for Skyscanner users in the Americas. India’s popularity for long-stay holidays, however, may soon be rivalled by the Philippines, which has seen a high growth in exits. Most notably though, is the growth in both searches and exits of Japan. In time, we could see it competing for a spot in the Top 10 most popular destinations. The data on our users in the Americas has shown that the most popular day for searches is on a Tuesday; which is also the most popular day for exits. This could indicate several characteristics, including a short planning process, a high purchase intent when coming to Skyscanner, and a clear consideration set before their search and planning process is initiated. Whilst users have a higher intent to book in October and November, as indicated by the increase in exits during these months, the high search volumes in summer months indicate they are seeking inspiration and aim to plan during this time.